Its finally finished and very happily received! 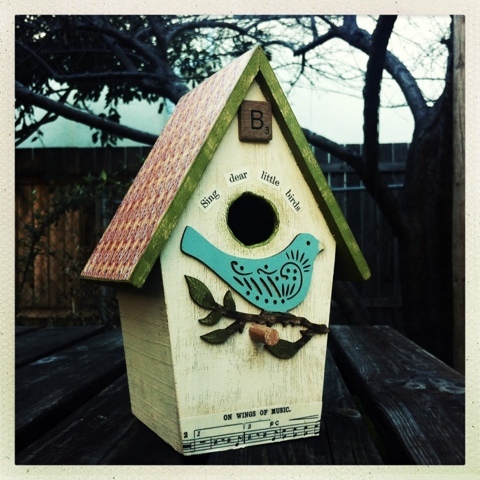 The birthday girl loves her new birdhouse amplifier. 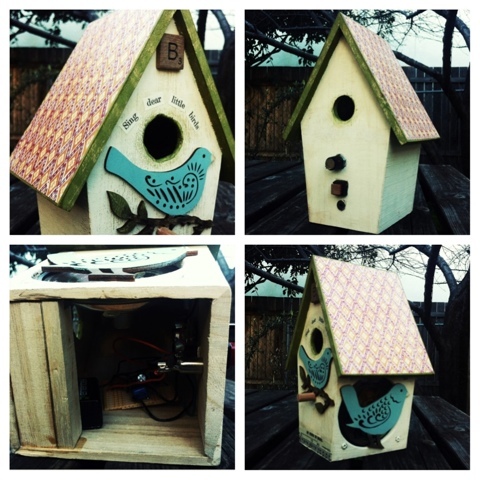 Thanks to my creative partner in crime, my husband the electronics master and wood shop wizard, I was able to turn this cute birdhouse into a music box. A simple birdhouse I found at the craft store, some paint, decoupaged paper, wooden embellishments and found text were my contribution. My husband worked his magic with the electronics so it could be used as an iPhone or lap top amp. Both of our hands, hearts and minds went into creating this functional piece of art. We're very proud of it. I think we've got a good thing going here. Thanks to my sweet man for bringing music to my art.